The cinematography is very good, and the movie looks interesting visually. In short, many of the people act totally out of character, especially Jonathon Kent (Kevin Costner, who did very well with the role that he was given). Jonathon Kent is quite content for people to die — any number of people, in any number of ways — as long as Clark keeps his identity secret. It’s not that the writers have to stick to the interpretation from the comics — that’s certainly changed over the years, with different writers and countless reboots of the DC universe. But this is the man who is supposed to have instilled in Clark his bedrock sense of morality. In contrast, Lawrence Fishburne acts entirely in character as Perry White — gruff, caring about his staff, caring about reporting the truth. Superman/Clark Kent/Kal-el himself (portrayed well by Henry Cavill) — seems to be swept along by a series of events, rarely being allowed to make his own decisions, and chart his own destiny — even going so far as to violate Superman’s prime rule, in order to stop Zod from murdering innocent civilians toward the end of the movie. It’s Hobson’s choice, where he’s forced to choose between bad and worse. All too often through the film, he comes across like a bobber on the ocean, carried about by waves of circumstances that other people are making. 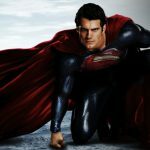 Not caring about civilians: in the very long, protracted fight scenes, Superman makes no effort to move the fight to an uninhabited area … and thousands, if not tens of thousands, of innocent civilians are injured and/or killed. Totally out of character. 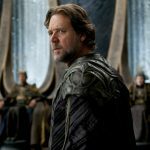 Krypton: the planet that Superman is the last survivor of, hardly seems worth mourning. Everyone on the planet is genetically engineered, and assigned at birth to their task: military, scientist, plumber, or whatever. If you don’t want to be that? Too bad; the State has chosen for you. 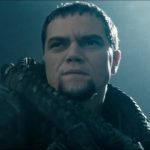 When Zod — loyal military man — stages a coup on Krypton against the existing leadership (who typically are ignoring all of the warnings of the planet’s impending destruction) you almost want to cheer for him — except for his merciless, brutal methods. Logical flaws: many times, while watching the movie with my family, one or more of us would shout out “why doesn’t (x) simply do (y)?” and avoid the entire problem? Again, and again, and again. At a time when comic book heroes are increasingly distinguished by their flaws, Superman’s status as the ultimate good guy has caused him to fall out of favor. (How do you get audiences to relate to a dude who can push the moon out of orbit and has the morals of an Eagle Scout?) 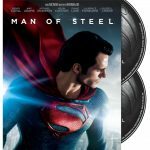 Man of Steel, producer Christopher Nolan’s attempt to give the hero a Dark Knight retrofit, succeeds in giving the character a fresh start, courtesy of both a gargantuan sense of scale, and Henry Cavill’s winningly unironic central performance. Devotees of Christopher Reeve’s legendary mild-mannered portrayal may find themselves missing the sequences of quiet time from the previous films (the steadily escalating plot spares little time for cats stuck in trees), but this still manages to uphold the gee-whiz qualities that made people buy the comics in the first place. For all of the stunning bangs and gigantic sonic booms, its greatest achievement may be in making Superman’s fundamental squareness feel like a virtue again. Nolan and director Zack Snyder (Watchmen) have kept the basic elements of the origin story–infant survivor of an alien world comes to Earth, crash lands in Kansas, grows up big and really, really strong–while putting a spin on virtually all of the details. 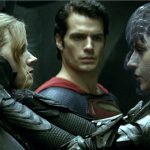 Here, Krypton is depicted as a wonderfully baroque ’50s sci-fi menagerie, X-ray vision has some painful flaws, and Lois Lane (Amy Adams) isn’t the type of person to be fooled by a pair of glasses.